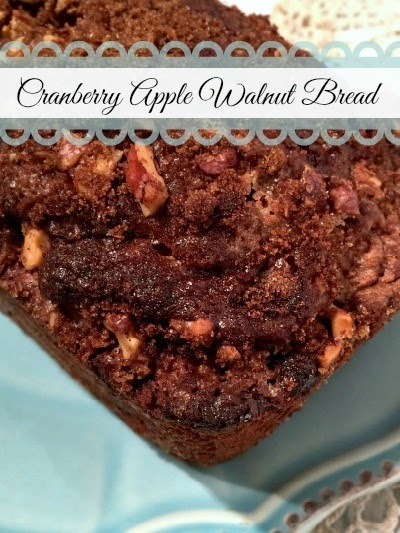 CRANBERRY APPLE WALNUT BREAD: Good enough for dessert, yet loaded with healthy ingredients! Today, I felt inspired. Partly by the pathetic, tiny bruised little apples my husband brought home after going grocery shopping for me (bless his heart). I wanted to redeem them (or redeem my husband), by finding a use for his sad little apples. And partly because I was feeling better after being in bed for several weeks recovering from back surgery. I felt like baking! 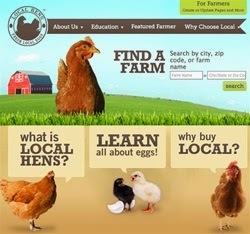 I'd create a farm girl original! I know, I know, there's nothing new under the sun, and variations of the bread I turned out have undoubtedly been made before. But what I made was my own concoction from scratch. It was beautiful and made the house smell so good! Then to hear my husband say, "Honey, this is the best bread you've ever made." (And he meant it)! Well, I knew I had to share my recipe with you. 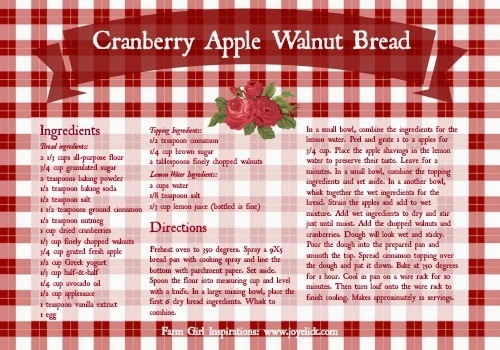 I gave my bread an original name: Cranberry Apple Walnut Bread. But don't let the boring name fool you. With it's topping of cinnamon, brown sugar and walnuts, this bread is good enough for dessert. It's the perfect sweet loaf: moist, but not heavy, and with a cake-like texture. But it's also guilt-free! 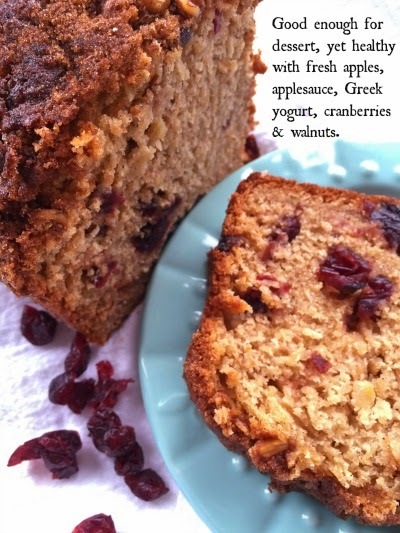 It contains healthy ingredients like fresh apples, applesauce, Greek yogurt, cranberries and walnuts. I hope you'll give it a try. After all, it's the best bread ever! (According to my husband, that is). So what do you say? Wanna give it a go? Well then, grab your apron and let's get started! Step 1: Preheat oven to 350 degrees. Spray a 9X5 bread pan with cooking spray and line the bottom with parchment paper . Set aside. Step 2: Spoon the flour into your measuring cup and level with a knife. In a large mixing bowl , place the flour, baking powder, baking soda, salt, cinnamon and nutmeg. Whisk together to combine. Step 3: In a separate small bowl, combine the ingredients for the lemon water. Using a grater, peel and grate 2 apples until you have 3/4 cup. As you grate, immediately place the apple shavings in the lemon water. 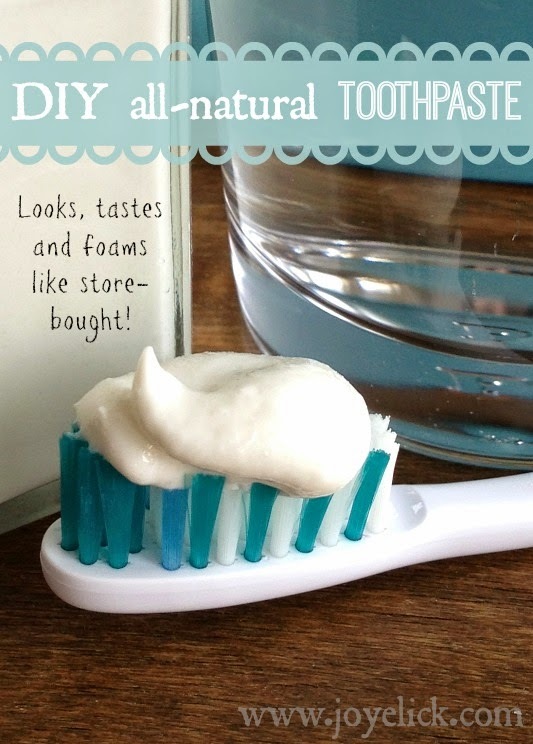 This will help preserve their taste. Allow the apples to remain in the water for about 2 minutes. Step 4: In another small bowl, combine the cinnamon, brown sugar, walnuts and oil for the topping, working the oil throughout the mixture with a fork until it's well combined. Set aside. Step 5: In a different bowl, whisk together the yogurt, half and half, oil, applesauce, and egg. Strain the apples from the lemon water and add them to wet mixture. Step 6: Create a well in the center of the dry ingredients. Pour the wet ingredients into the well and stir just until moist. Add in the chopped walnuts and dried cranberries. Avoid over-mixing, or your bread may turn out heavy and overly dense. Your dough will look wet and sticky. Pour the dough into the prepared pan and smooth the top with a spoon. Step 7: Spread the cinnamon topping over the surface of the bread dough and pat it down. Spray the surface of the topping with cooking spray. Bake at 350 degrees for 1 hour, or until a toothpick inserted into the center comes out clean. Allow to cool in the pan on a wire rack for 10 minute. Then turn the loaf out onto the wire rack to cool completely before cutting to serve. Let's chat...What's your favorite thing to bake from scratch? Where did you get the recipe--family heirloom, a friend, made it up yourself, or from a book or website? I'd love to hear from you in the comments below.